It was what they hoped would be the last point. The two tennis players were at a score of nine to eight in the ultimate tiebreaker. With a swift forehand stroke, the Batavia player had won it. An hour-long match over in just two seconds. As she came off the court with sweat dripping off her face coach Lisa Stoneberg smiled at her. The player was breathing as heavily as she could. Stoneberg began to tell her what a good match she had played against a difficult opponent. While another game had just finished as the player walked off the court with a sorrowful expression on her face, coach Stoneberg began to tell the player she had put up a good fight and would win the next game. As a high schooler at Batavia, Stoneberg played on Batavia’s tennis team, then became a teacher at the high school, and coaches tennis both at the high school and middle school. Her students and players say she exceeds at all these things. After finishing college, she came back to Batavia to coach the tennis team and teach Spanish at the high school. Her students say that she is a great Spanish teacher and she has helped prepare for future years of the language. While being Miss Stoneberg to her students, many of her tennis players know her as coach Stoneberg. But for a lot of them, there is no difference between Miss Stoneberg and coach Stoneberg. All of her students and players agree that she is a great a coach for so many reasons. “My favorite thing about coach Stoneberg is probably how kind she is and how patient. My friends and I came into tennis with no knowledge of how to play and through the season with the help of coach Stoneberg, we really improved,” said Della Williams, a Batavia tennis player. Tennis is one of the few cut sports at the high school along with cross country, which is why they have large numbers of kids that want to play. In the 2018 season, they had around 70 kids spread between varsity, junior varsity one, junior varsity two, and junior varsity three. Coach Stoneberg says that she wants her students to learn the game, and to love it as much as she did. Stoneberg said she is not only in love with tennis but she loves the community of people who have come together to play the sport and support their kids as they play the sport in high school. 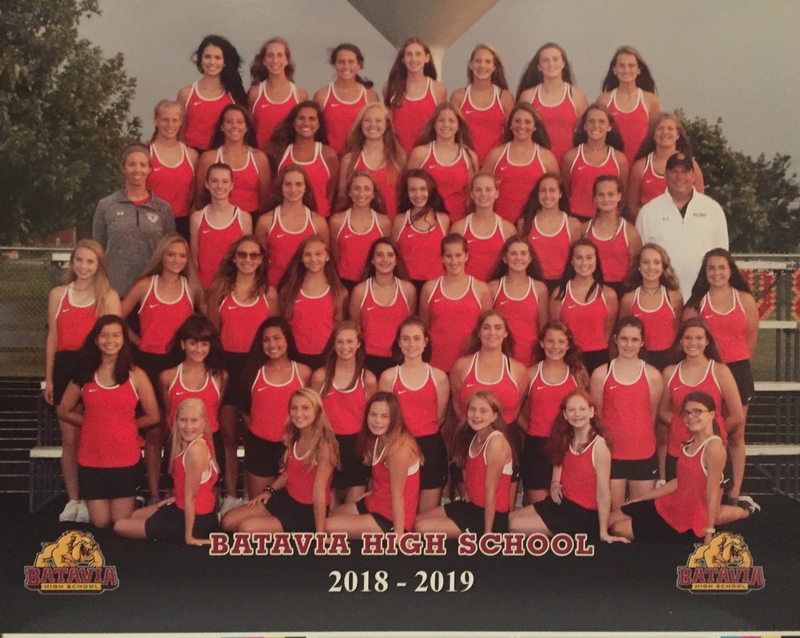 “Also, the Batavia tennis program is a fantastic community of players, coaches, and parents that I am thankful to be a part of!” Stoneberg said. Many of the players agree that tennis is a laid-back sport with a great group of kids playing. Happiness is never absent from tennis practices. They are always filled with lots of laughter and joy that can be heard and felt all through the courts. Some will even admit that it was the most fun they’d ever had and that the environment was truly healthy. In addition to providing great practices, Stoneberg helps run the summer tennis camps. Many of the players on the team attend these camps as a prep for the season start up that fall. Stoneberg also helps runs a six-week camp at the middle school to help the middle schoolers find a love for tennis and make them want to join the team when they reach high school. The camp’s environment is also very similar to the high school’s environment. Many of the players on the team have done this camp all through middle school. Do BHS students use their lockers? Jon Danielson on What is Type One Diabetes?